A music composition / analysis tool. Create a tone row by clicking on the staff or the piano keyboard. Twelve Tone will automatically create the Prime, Inversion, Retrograde, and Retrograde Inversion Magic Square. Save your rows or pitch class sets of 1 to 12 tones, with its name, current P, R, I, RI matrix markings, derivation and preferred accidentals settings. 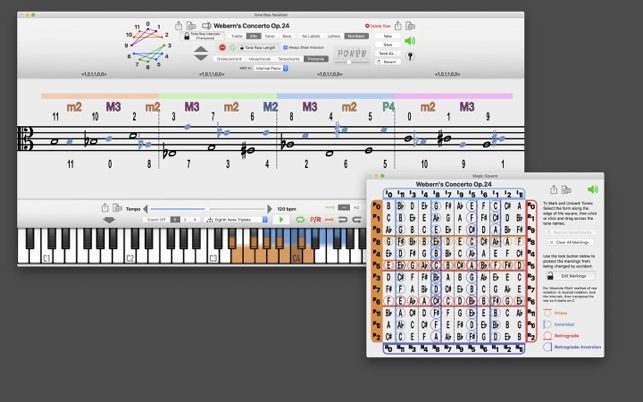 Save and Share PDFs of the notation, magic square, circular diagram, and piano representation of the tone row or set. 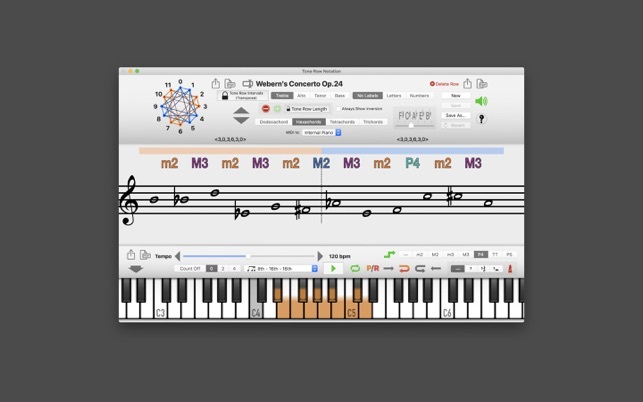 Drive your own software or hardware synth via MIDI to hear the instrument you want, or use the app's own acoustic piano. 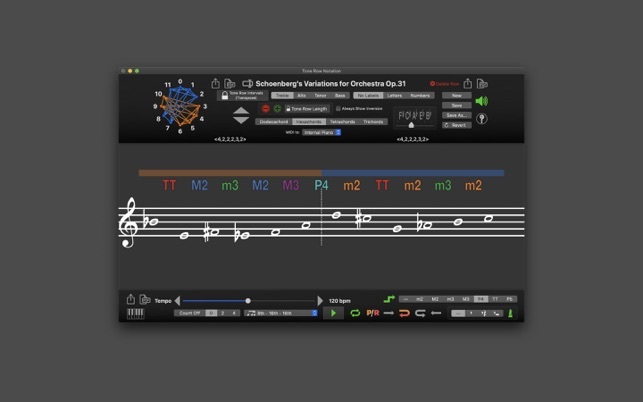 Twelve Tone lets you know if any notes are repeated by highlighting both notes. Press the play button and hear your set played back with your selected rhythm. Select the transposition interval and direction when looping playback. Hear the pitches as you mark them in the magic square. The marks indicate the row form in which the pitch belonged; Prime, Inversion, Retrograde, and Retrograde Inversion. Lock the square to avoid accidentally marking or unmarking notes, and erase the entire square with the touch of a button. Lock the prime row notation and transpose it to C to use the Absolute Pitch Method for labeling in the matrix. Added MIDI out. Send MIDI note on/off commands to external apps like Apple's GarageBand® or connected external MIDI hardware. Love the idea, I will use this for sure, and really appreciate the effort put in to make this. Its really convenient to be able to type in a row, and see the various forms in the Magic Square! This is also very useful when doing analysis. For me the interest is in composition. Printing it out is very useful. 1) In this current version 1, it has a very clunky interface. I am pretty sure (hopeful) that will change. 2) There is no “NEW” row option ("save as” is NOT elegant, at all). It can be included in the FILE menu, and also as a small button on the upper right corner. 3) No place I can find for setting up WHERE the sound will come out (if its “internal speakers” it works, but not if one has an audio interface it seems). Need some sort of “Preferences” to be able to set up things. I realize this is version 1, but since the developers are charging for this, the least that they can do is give us a place to set Prefs. 4) It would be nice to have some options to get rid of the HUGE note names above the staff!! 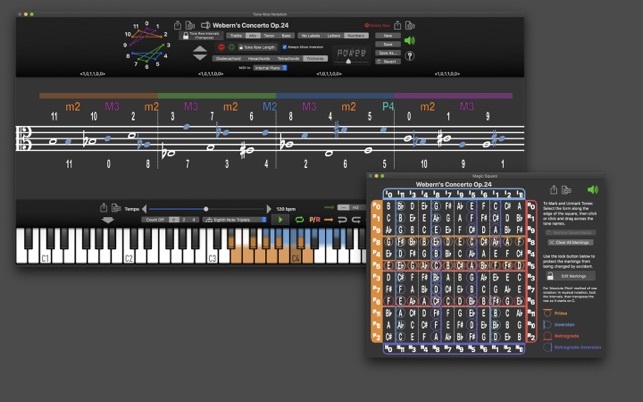 Honestly, if someone is using this type of software, one can pretty safely assume that they can read music. Developers: please, at least make it an option to HAVE the note names displayed (it looks just awful and cluttered with them there) and defaulting to NOT have the names there. Would be interested in your thoughts on the update. Copyright © 2010 - 2019 Patrick Q. Kelly. All Rights Reserved.